For the fifth time in a row this season, the Marlies and Monsters needed extra time for a game decision. After jumping out to a 4-1 lead, things started to go south for the Marlies just past the halfway mark of the game. The Monsters answered back with four consecutive goals and took their first lead of the game midway through the third period. A late power play goal for the Marlies sent the game into overtime. Despite a number of chances at both ends, the extra time didn’t solve anything. Gagner scored in the shootout, but Timashov and Marchment were both stopped by Jean-Francois Berube. Nathan Gerbe and Mark Letestu scored for the Monsters to seal a 6-5 win. Carl Grundstrom opened the scoring at 4:18 of the first period, firing a rocket past Berube. The goal was Grundstrom’s 12thof the season and was unassisted. Minutes later, Colin Greening entered the zone fighting off multiple Monsters’ players to get in deep against the boards. He found Pierre Engvall behind the net who centered a pass out in front of the Monster’s goal where Jeremy Bracco was waiting on the doorstep to tap home his 11thof the season. The Monsters got on the board at 17:10 with a goal from Doyle Somerby. 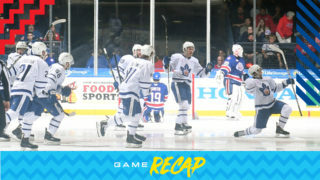 Shots on goal in the opening frame were even at eight apiece while the Marlies held a 2-1 lead on the scoresheet. 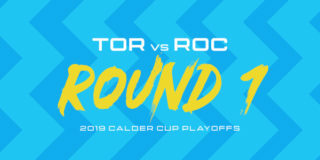 At 2:57 of the middle stanza, Adam Brooks extended the Marlies’ lead to 3-1 after a pass intended for Mason Marchment went in off a Monsters’ player. At 7:06, Rich Clune beat Berube in the slot for his first of the season. Engvall and Greening assisted on the goal. Just past the halfway point of the frame, the Monsters added back-to-back goals, bringing them within one heading into the final frame. The Marlies held the Monsters to five shots on goal in the second while they registered 14. The Monsters evened things up at 7:12 as Kole Sherwood beat Hutchinson. At 11:41, they took their first lead of the night following a goal from Eric Robinson. 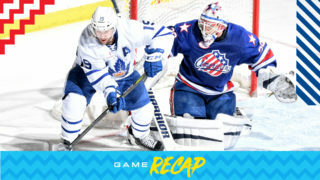 Late in the frame, the Marlies capitalized on a power play as Sam Gagner beat Berube with a rocket from the hashmarks to even the score 5-5 and force overtime. The extra time wasn’t enough to solve this one, so the game turned to a shootout. Cleveland’s Nathan Gerbe was the first shooter and beat Hutchinson to give the Monsters the advantage. Sam Gagner was up first for the Marlies and scored to keep things even. Mark Letestu shot second for the Monsters and was successful, while Dmytro Timashov missed for the Marlies. 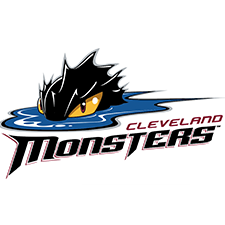 The third shooter for both sides missed so the Monsters sealed a 6-5 win with Letestu’s goal. 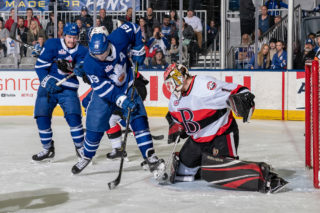 The Marlies will look to bounce back this weekend when they visit the Belleville Senators for back-to-back games Friday and Saturday. Carl Grundstrom opened the scoring unassisted at 4:18 of the first period. Grundstrom has collected eight points (3 goals, 5 assists) in six games against Cleveland. Jeremy Bracco scored at 6:34 of the first period and later picked up the secondary assist on Gagner’s third period power play goal. Bracco has 15 points (4 goals, 11 assists) in his last 10 games, with his four goals from his last five games. Adam Brooks scored unassisted at 2:57 of the second period. He has picked up seven points (3 goals, 4 assists) through five games against Cleveland. Brooks has two goals in two consecutive games. Rich Clune scored at 7:06 of the second period. This was his first point through six games the season. Sam Gagner scored on the power play at 17:44 of the third period. Gagner has 32 points (10 goals, 22 assists) in 35 games this season. Pierre Engvall recorded the primary assists on Bracco’s first period goal and Clune’s second period goal. Engvall has six points (4 goals, 2 assists) in his last five games. Colin Greening registered the secondary assists on Bracco’s first period goal and Clune’s second period goal. Greening has 12 points (3 goals, 8 assists) in 42 games this season. Calle Rosen had the primary assist on Gagner’s third period power play goal. Rosen has four points (1 goal, 3 assists) in three consecutive games. Michael Hutchinson stopped 29 of 34 shots he faced. Hutchinson is now 4-3-2-1 on the season with a .899 Save Percentage and a 3.47 Goals Against Average. Toronto went 3-for-3 on the penalty kill and 1-for-3 on the power play. 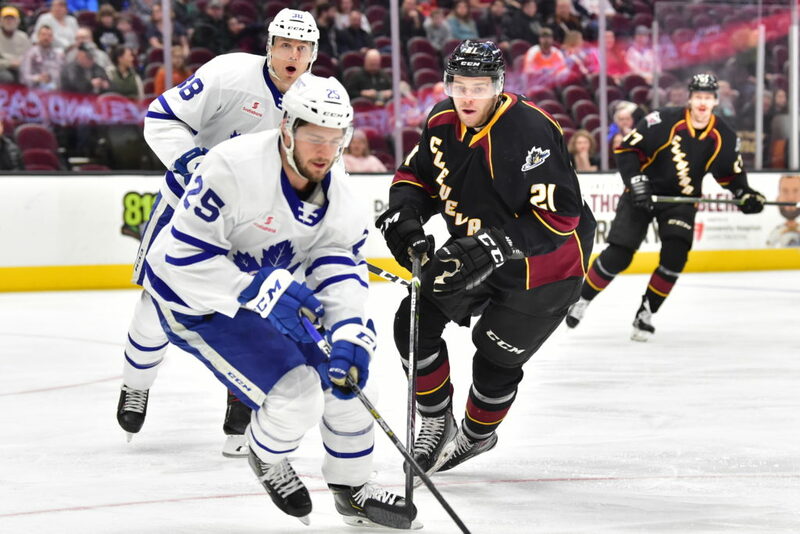 Cleveland had a 35-28 edge in shots in all situations.Jeremy Bracco, Adam Brooks and Carl Grundstrom led the Marlies with three shots on goal. Toronto’s away record is 12-6-1-2 and the team is second in the AHL in scoring on the road (98). The Marlies are 14-13-3-2 against North Division opponents and are 2-1-1-2 against the Monsters. Cleveland has outscored Toronto 30-26, with three games ending in overtime and two in a shootout. The Marlies are currently on their annual Boat Show road trip, returning to Coca-Cola Coliseum on February 1. Toronto is 2-0-0-1 and have outscored their opponents 14-9. Before the All-Star Break (January 27 to January 30), Toronto will finish their road trip this weekend, facing the Belleville Senators twice. Toronto is 18-4-1-1 when scoring first. The Marlies are 14-1-1-1 when leading after the first period and 15-0-1-1 when leading after the second period. Toronto is 7-7-1-2 when outshot by their opponent. The Marlies are 3-2-0-1 in Wednesday games and are 6-2-0-1 in January. Jeremy Braccohas recorded points (2-3-5) in two consecutive games. Pierre Engvallhas recorded points (2-2-4) in two consecutive games. Carl Grundstromhas points (1-1-2) in two consecutive games. Calle Rosenhas recorded points (1-3-4) in two consecutive games. January 23:Recalled forward Trevor Moore from loan by Toronto (NHL). January 18:Loaned forward Emerson Clark to Allen (ECHL). No, never. I think we are very fortunate to get a point out of this game here today. Despite having leads, I don’t think we ever deserved to be up 2-0. I don’t think we deserved to be up 4-1. That’s as bad of a game as we’ve played in quite a while here so it’s quite disappointing. We just weren’t ready to go right from the start, right from the opening faceoff of the game. We missed our assignments, we don’t do our jobs and we’re at game 42, we should know what to do when the puck drops…hard to find any guys that came here to play today, forwards, goaltending, defence, they all just weren’t good enough, they weren’t good enough here. We were playing against a good team, they’ve played us hard all year, they’ve come back on us all year and like I said, we didn’t deserve to have the lead today and we were very fortunate to get a point out of this one. Recover is what we’ve got to do. We looked like a really tired, sluggish team today. It’s our eighth day on the road, maybe that’s a factor. We have to travel home here and try to recharge as best we can in the 24 hours or so that we’ll be in Toronto and then get out to Belleville, two more games before the break here but we just got to dig in and we show signs of being a good team and then take a pretty large step backwards today so we’re going to have to regroup here and (then) travel day and then rest day and get ready to go against a hungry Belleville team that wants to chase us in the standings just the same. The Toronto Marlies (21-15-3-2) return to action tonight on the heels of a successful trip to Charlotte that saw them sweep their weekend series against the Checkers. The Marlies have had a strong showing on the road so far this season (12-5-1-2) and their 93 goals are good for second in the AHL in scoring on the road. With wins in their previous two contests and a 7-3 record in their past 10, the Marlies will be looking to make it three in a row when they visit the Monsters tonight. Although they’ve been plagued by inconsistency, the Marlies look to be finding their stride as they continue to focus on the importance of playing a full 60-minutes. That will be key for success tonight as their previous games against the Monsters this season have been close fought battles. Tonight marks the sixth matchup between these North Division rivals with the Monsters holding a 3-2 lead in the season series. 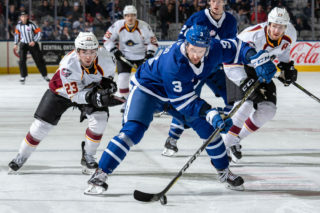 The Marlies and Monsters went head-to-head four times in November with three games needing an overtime decision and one requiring a shootout. The Cleveland Monsters (19-16-4-1) are 3-6-0-1 in their previous 10 game sand are coming off a shootout win over the Laval Rocket. 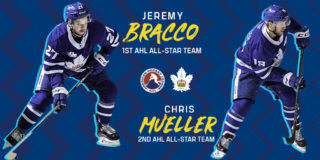 Players to watch: Jeremy Bracco recorded three points over the weekend (1G, 2A) and now has points in two consecutive games. He continues to lead the league in assists with 30. Pierre Engvall scored in back-to-back games this past weekend and now has four points in his last five games. Zac Dalpe and Nathan Gerbe lead the Monsters with 29 points apiece.